The all-new Audi RS 5 Coupé is the pinnacle of the A5 models. Proudly displaying the new Audi Sport design idiom, the all-new RS 5 Coupé packs more power and increased torque. Combining the reduced weight and state-of-the-art systems, the Audi RS 5 Coupé has had substantial improvements in performance. 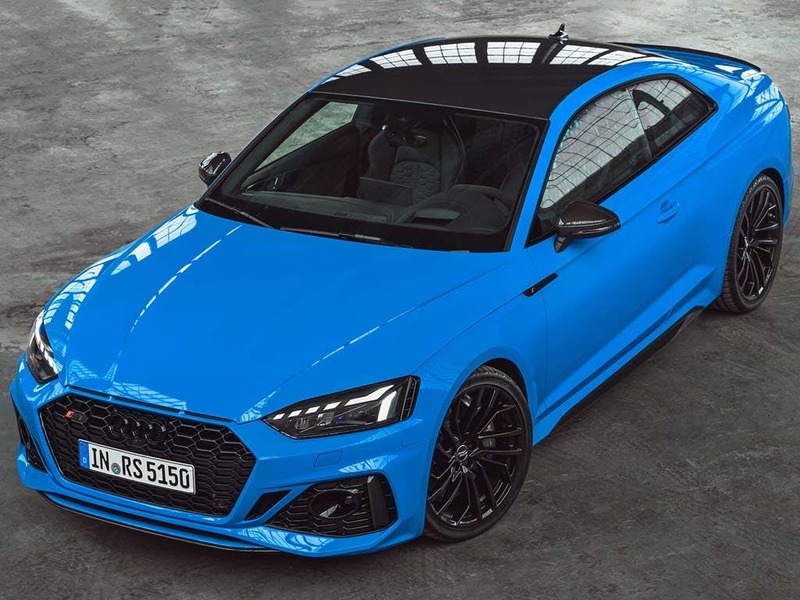 Add in major innovations in connectivity and advanced systems for driver assistance and safety, and the all-new Audi RS 5 Coupé is one of the most desirable performance cars around. Discover more about the new Audi RS 5 Coupé at you nearest Audi centre in Essex, Hertfordshire and London. Every detail matters, view the Audi RS 5 Coupé technical specification. 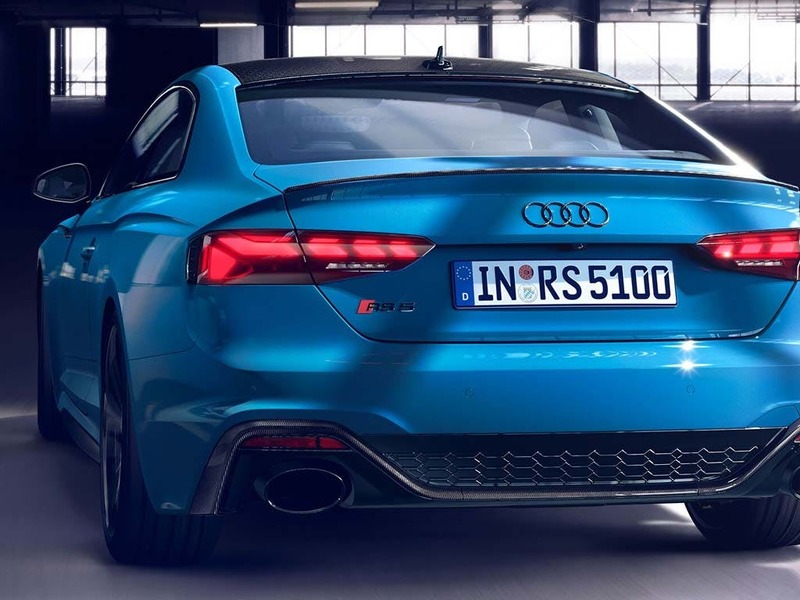 Download the latest RS 5 Coupé brochure. It’s black, first class and superbly well-appointed. With RS logos on the seats, steering wheel, door sill trims and gear selector, there’s no doubt about the RS 5 Coupé’s pedigree. Put the RS 5 Coupé through its paces in ultimate comfort, as the RS sports seats support you through every twist and turn. The flat-bottomed RS sport steering wheel with its multi-functional controls invites you to enjoy the exceptional drive. 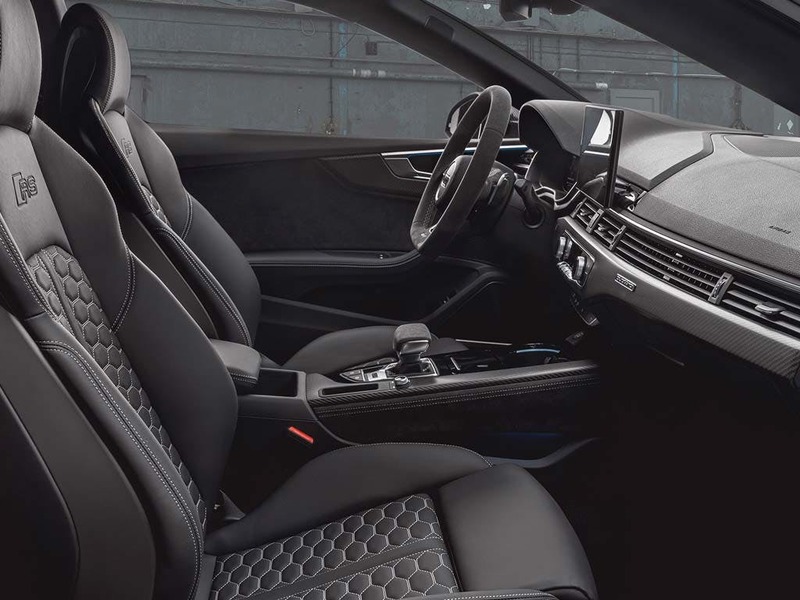 Opt for the RS design package for an ever more accented interior upgrade. Leading the way for future Audi Sport models, the all-new Audi RS 5 Coupé proudly exhibits the new Audi RS design idiom. 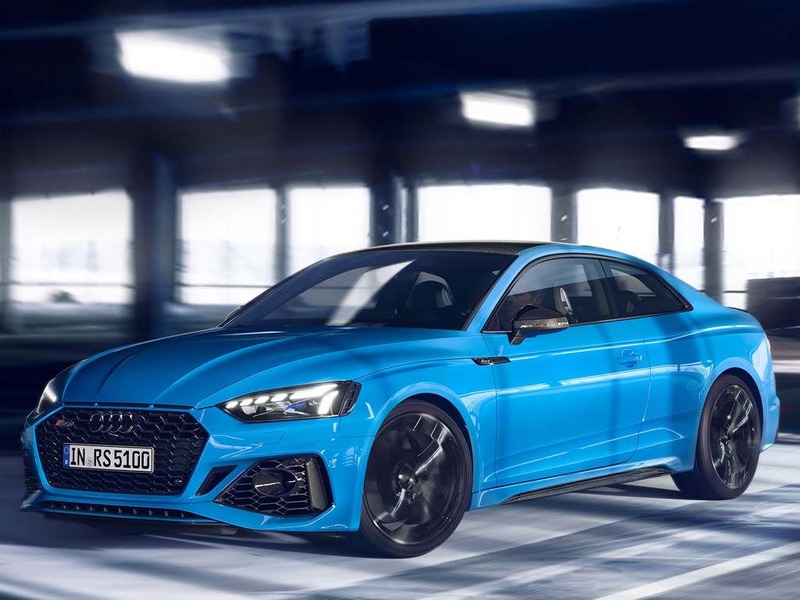 Inspired by the Audi 90 quattro IMSA GTO, the front of the RS 5 Coupé is impressive, with its large air inlets and the wider, flatter single frame radiator grille. 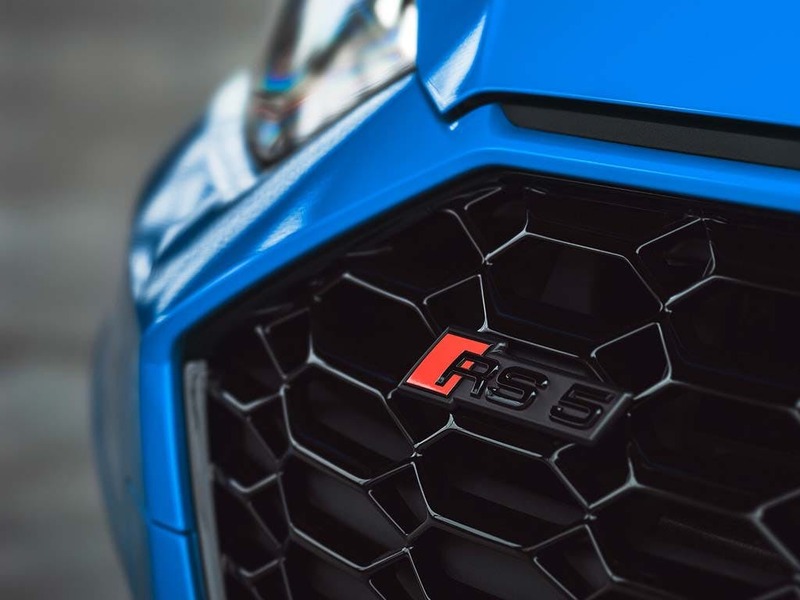 At the rear, the wheel arches have been widened by 15mm and are characterised by their bulging look, emphasised by the quattro blisters, all leading down and away to the oval tailpipes of the RS exhaust system. Turn heads with the new Audi RS 5 Coupé. 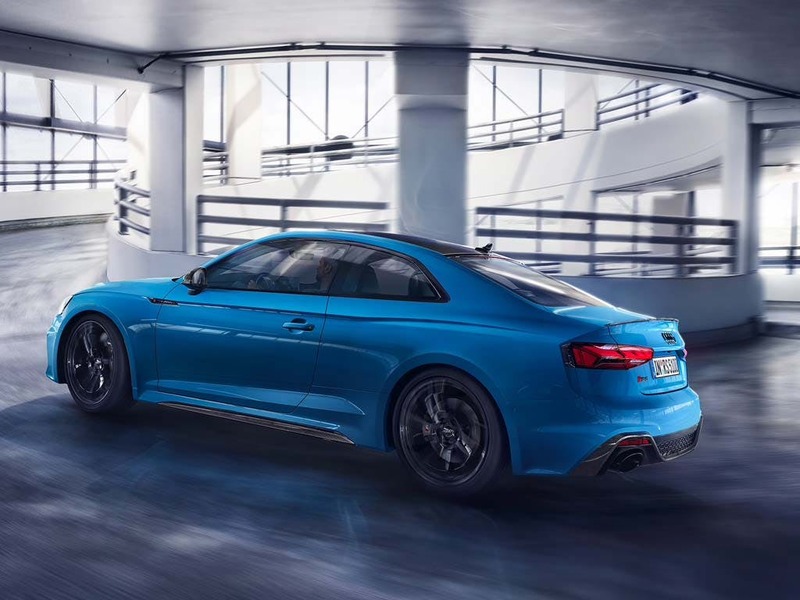 The Audi RS 5 Coupé comes with an all-new power unit, the biturbo V6 2.9 TFSI. 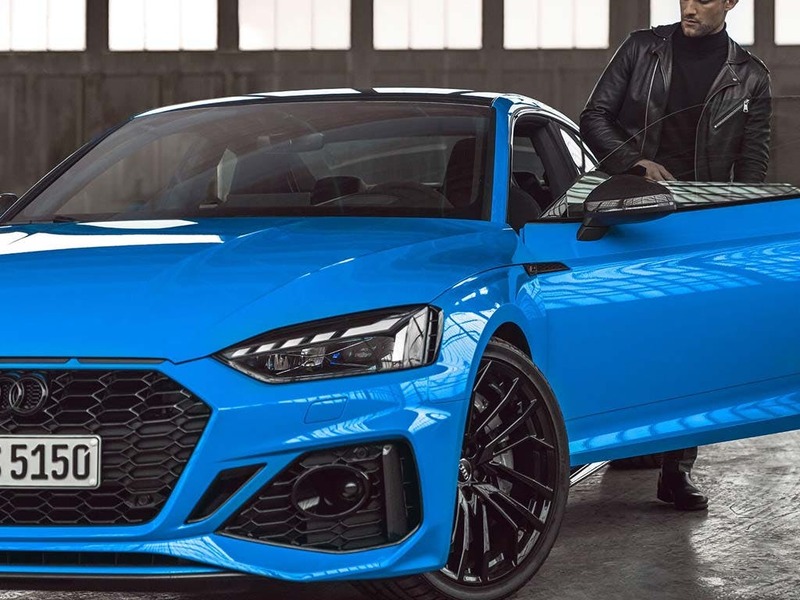 Generating 450PS, as well as 600Nm of torque between 1,900 and 5,000rpm, this 2.9 TFSI engine pushes the RS 5 Coupé from a standstill to 62mph in a heart-racing 3.9 seconds. 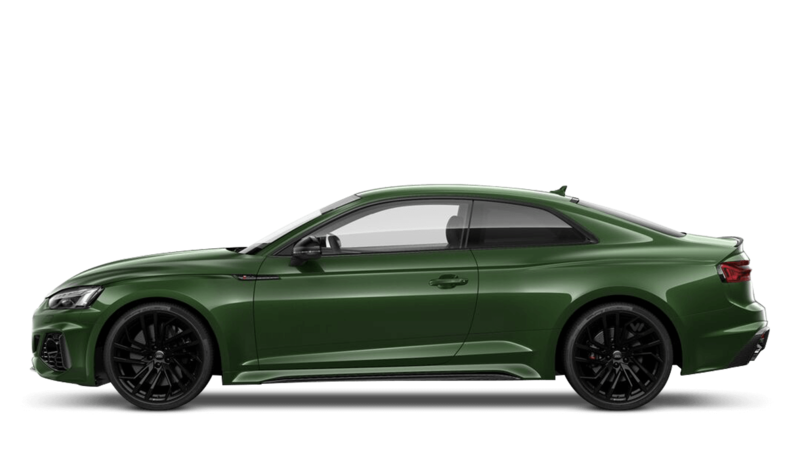 With a top speed of 174mph, the superb performance of the RS 5 Coupé offers a combined fuel consumption of 32.5mpg and 197g/km of CO2. Discover the driving experience you’ve always been waiting for with the new Audi RS 5 Coupé. Offering a wealth of options to keep you and everyone on board entertained, the new Audi RS 5 Coupé will keep you fully informed. MMI Navigation Plus with MMI touch comes with Audi connect, offering Internet access via LTE and your passengers can make use of the Wi-Fi hotspot. The Audi smartphone interface comes with Apple CarPlay and Android Auto, allowing access to an array of apps. Access these services through the multi-functional steering wheel, language voice control and a touchpad in the centre console. Take your drive to the next level with the new Audi RS 5 Coupé. Experience speed like never before with the new Audi RS 5 Coupé. Visit your nearest Audi dealership in Colchester, Chelmsford, Chingford, Finchley Road, Harold Wood, Hatfield, Stansted, Southend, Whetstone and Watford for more information. Explore the RS 5 Coupé specifications.